These introductory comments are from “The Lewis & Clark Cookbook – Historic Recipes from the Crops of Discovery & Jefferson’s America” by Leslie Mansfield, published in 2002. 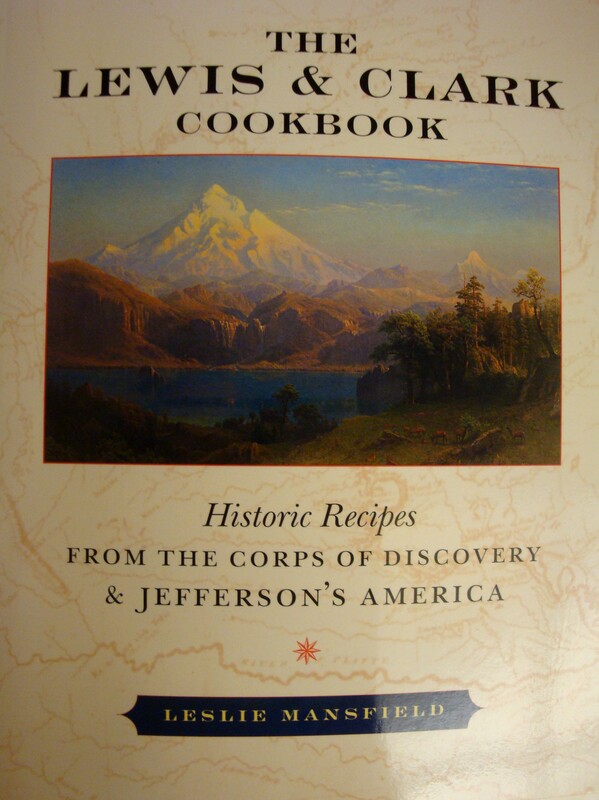 The recipes in the book were researched, and use “historically accurate ingredients” and include a cross-section of some of the foods, which Lewis & Clark would have consumed during their sojourn: “Bear with Red Wine, Mushrooms and Juniper Sauce”, “Buttermilk Huckleberry Pancakes”, “Cream of Sorrel Soup”, “Buffalo and Forest Mushroom Shepherd’s Pie”, and one that particularly intrigued me, “Dried Apple Pie”. 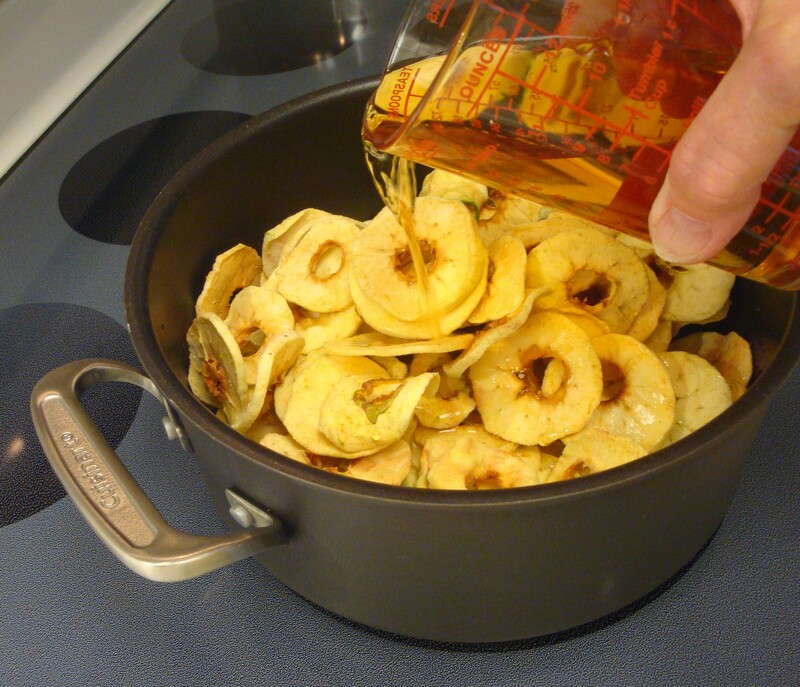 In a large saucepan, combine the dried apples, apple juice, and water. Bring to a simmer over medium heat, then reduce the heat to medium-low and simmer until most of the liquid has been absorbed. 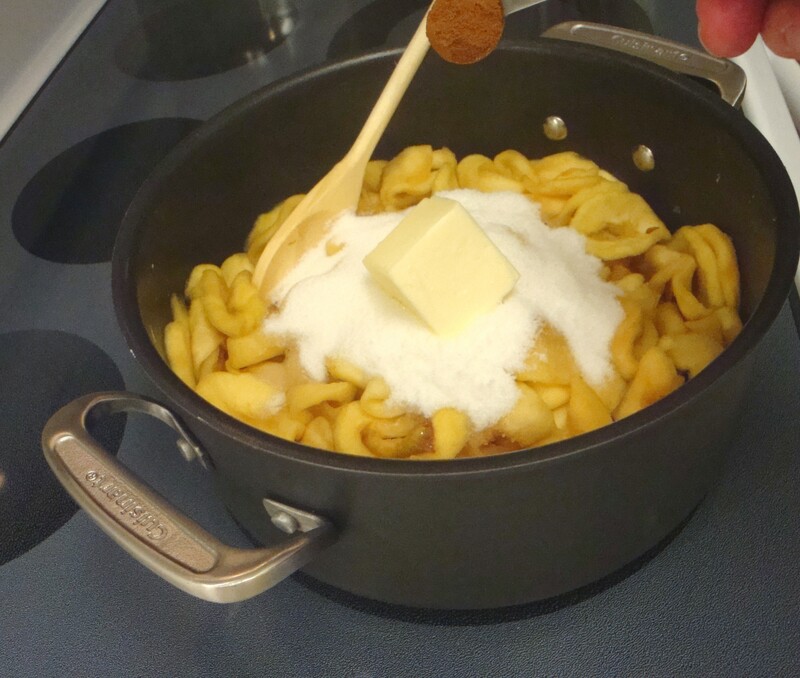 Stir in the sugar, butter and cinnamon and simmer until the mixture is thick. 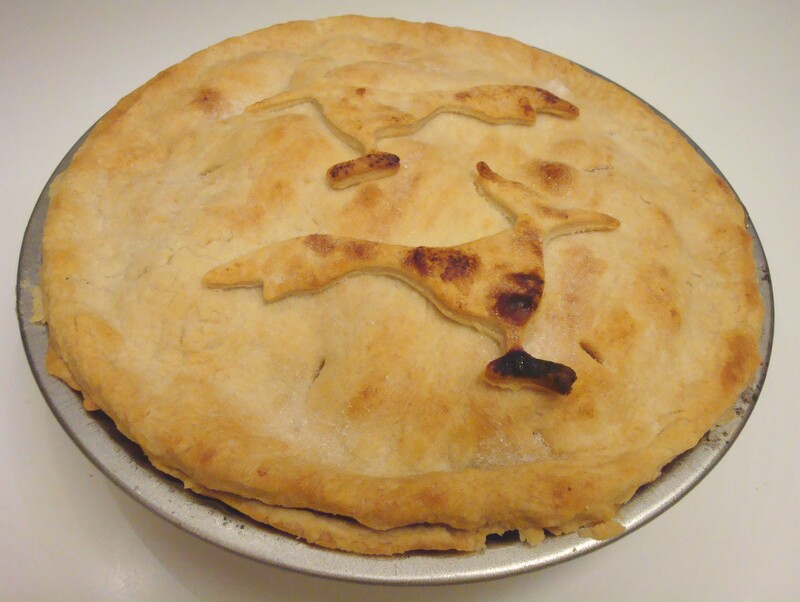 Line a 10 inch pie plate with half the pastry dough and prick all over with a fork. 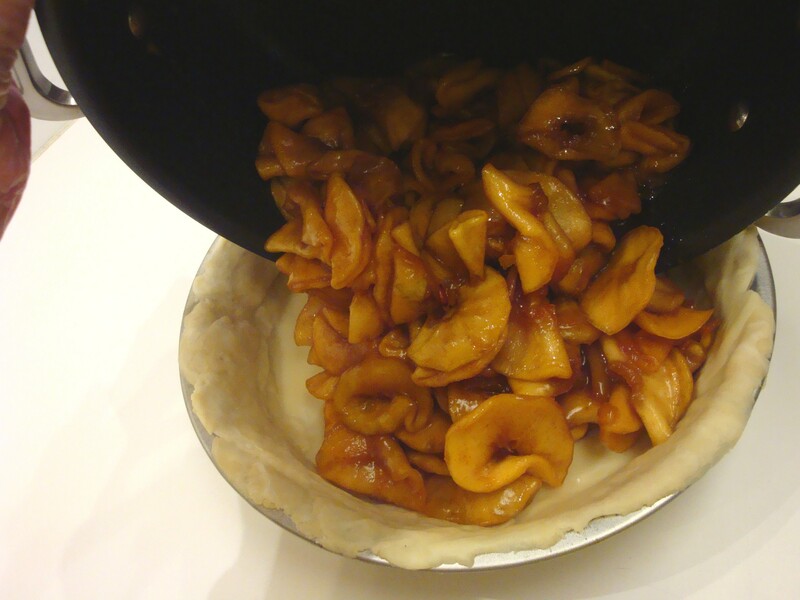 Pour the apple mixture into the pie shell and adjust the top crust. 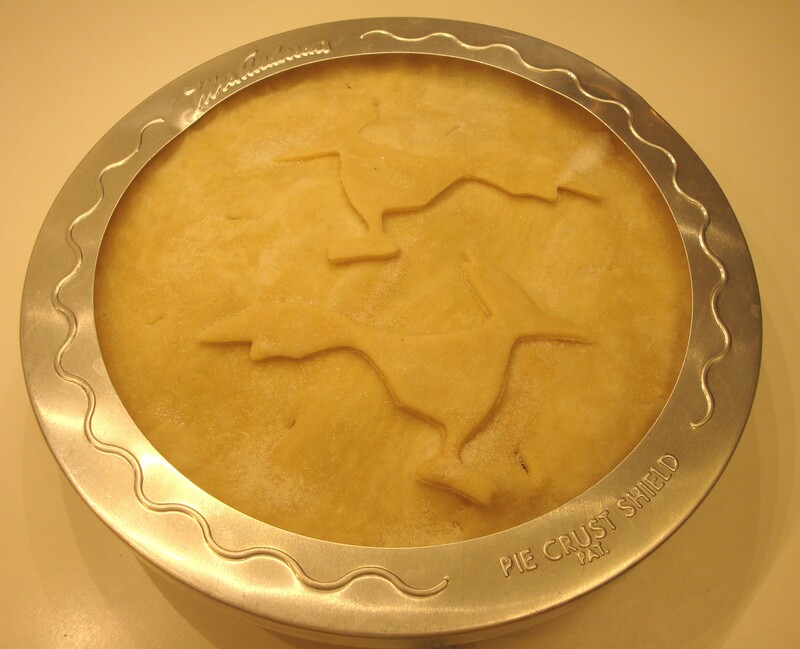 Cut decorative vents in the top crust to allow the steam to escape. 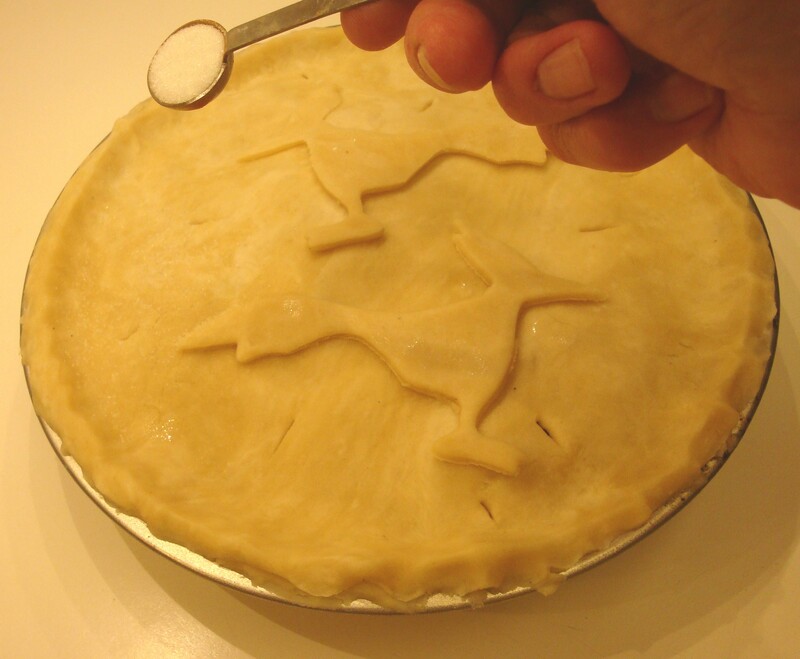 Sprinkle about 1 tablespoon of sugar over the top of the pie. Bake for 10 minutes. Reduce the oven temperature to 350 degrees and bake for an additional 40 minutes. Serves 8. Now, here I have to backtrack. 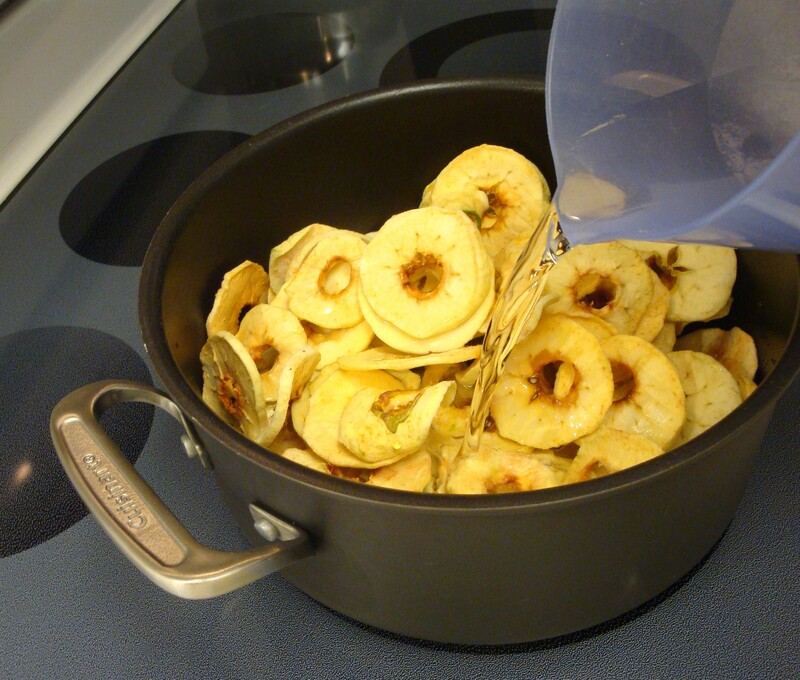 I decided that if I was going to be authentic, I’d better dehydrate the apples myself, instead of purchasing treated, too dry, expensive ones from the store, as I have a food dehydrator (a “Nesco”). I purchased a selection of three apple varieties: 3 Johnagolds, 3 Granny Smiths and 2 Red Delicious. 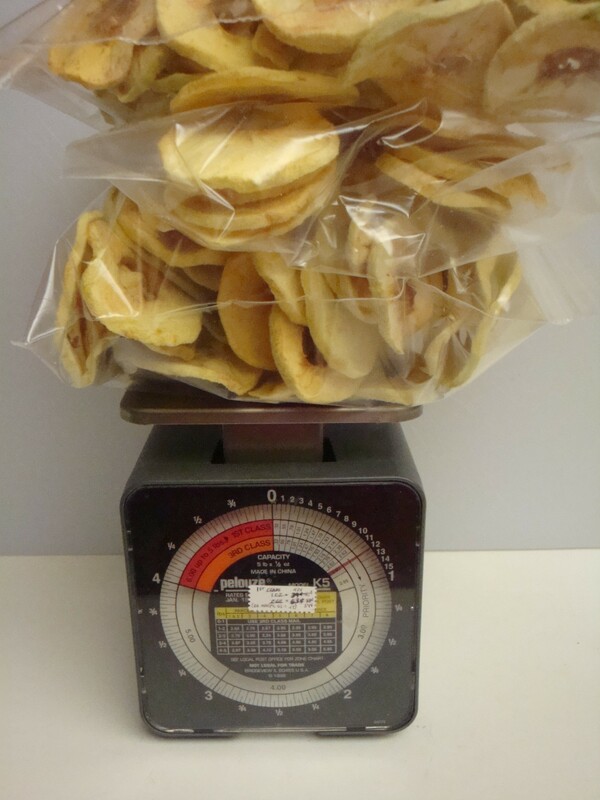 After washing, coring and peeling, I sliced them in to rounds a little less than ¼ inch thick and layered them in the 4 racks of the dehydrator. 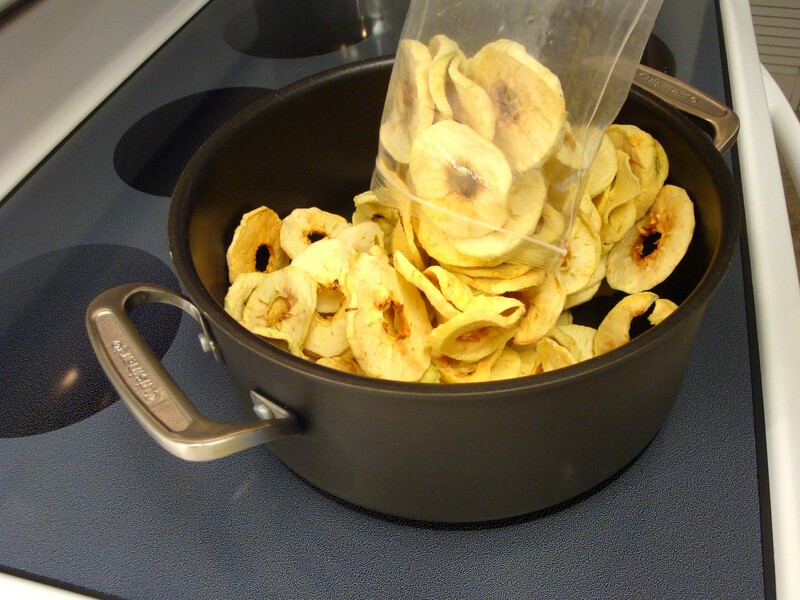 After leaving them overnight (about 15 hours), they were dehydrated, but not dried out or crispy. I bagged them and weighed them. 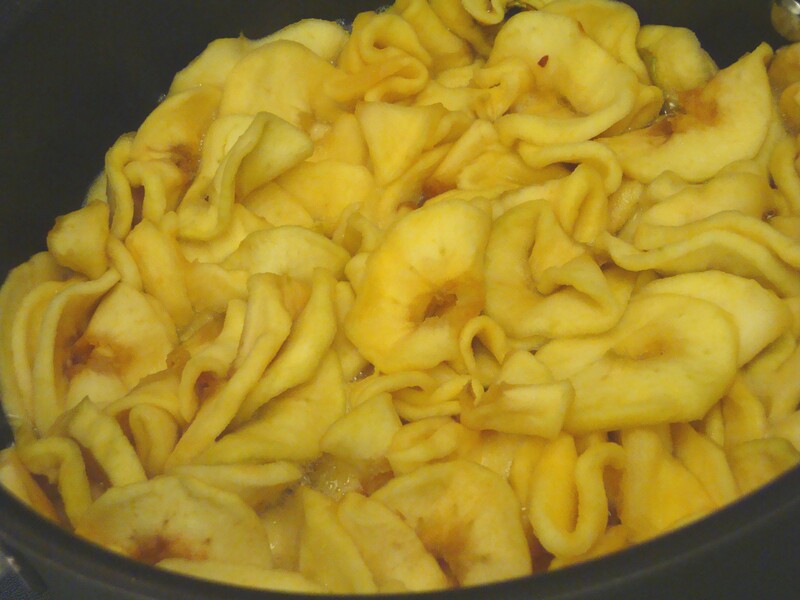 After drying, the 8 apples came to a weight of only 8 ounces, and as the recipe called for 16 ounces, I had to dry another batch, so I went with the same combination of the three varieties, for a total of 16 apples. 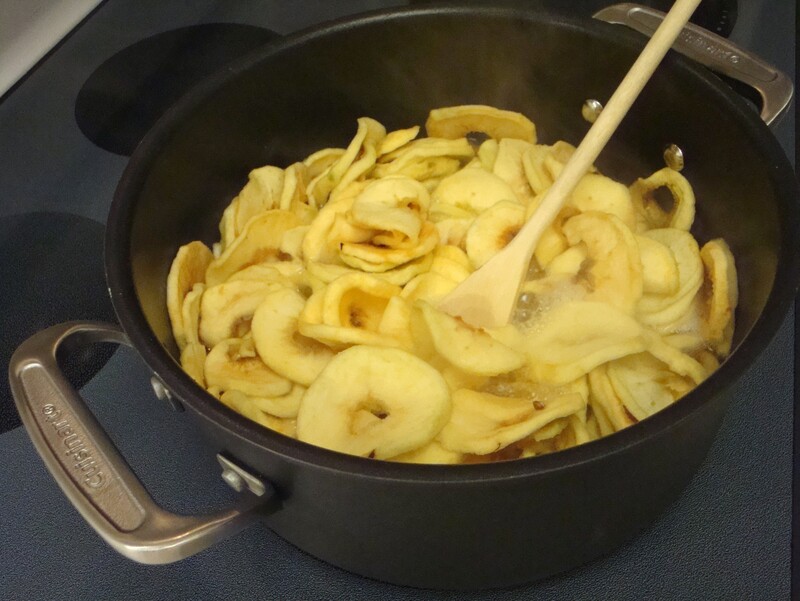 Following the second drying, I still had only 12 ounces of dried apples, but it looked like it would be sufficient for a pie, after rehydrating, so I went with it. 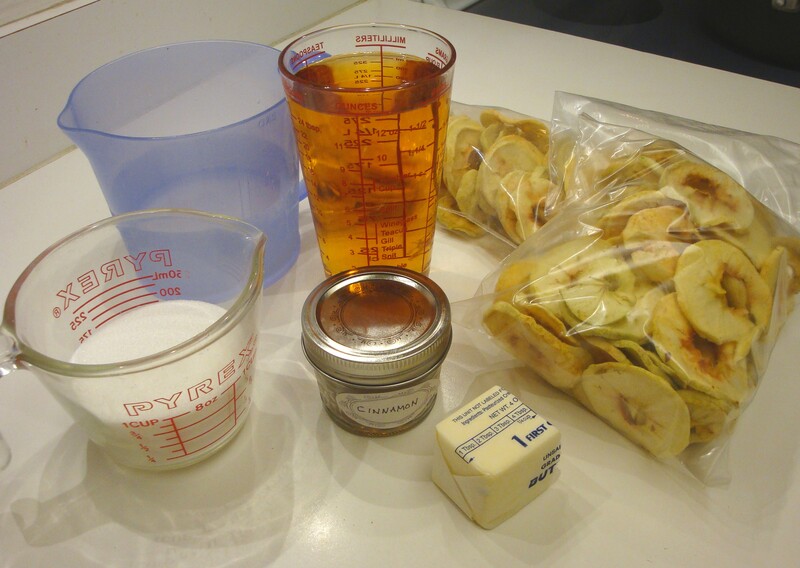 After assembling all of the ingredients, I began the rehydration process as the recipe directs. 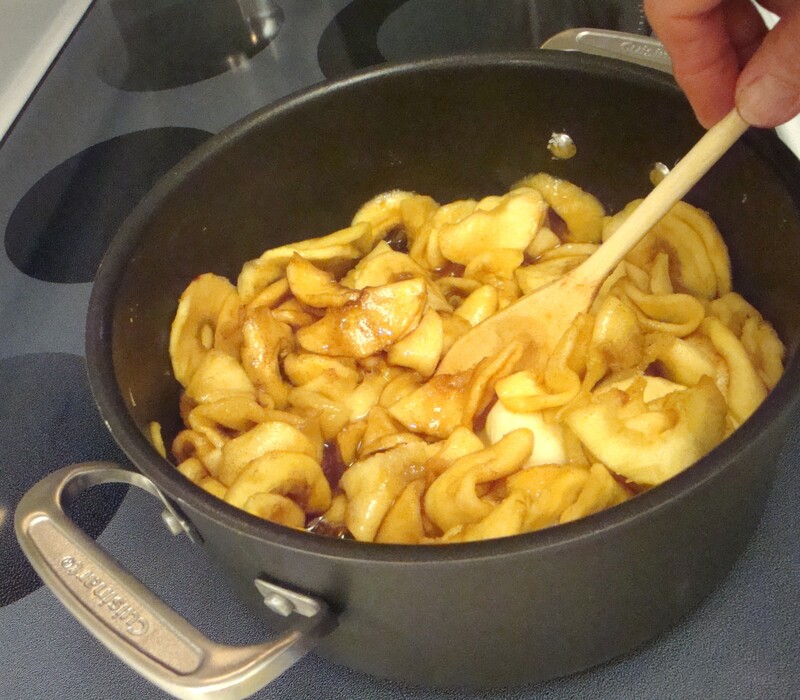 After 25 minutes, the apples appeared to be nicely hydrated and softened, and I added the sugar, butter and cinnamon. 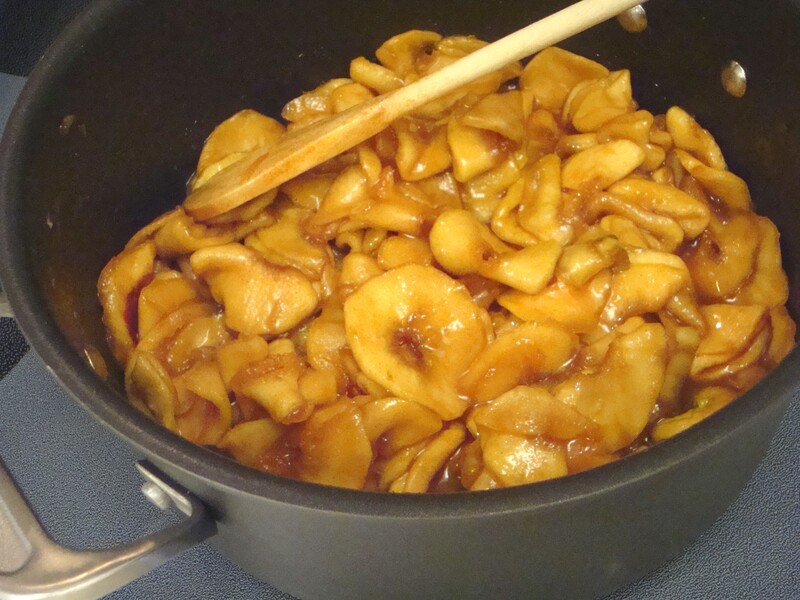 After about 10 more minutes of simmering, the mixture was nice and thick and fragrant. 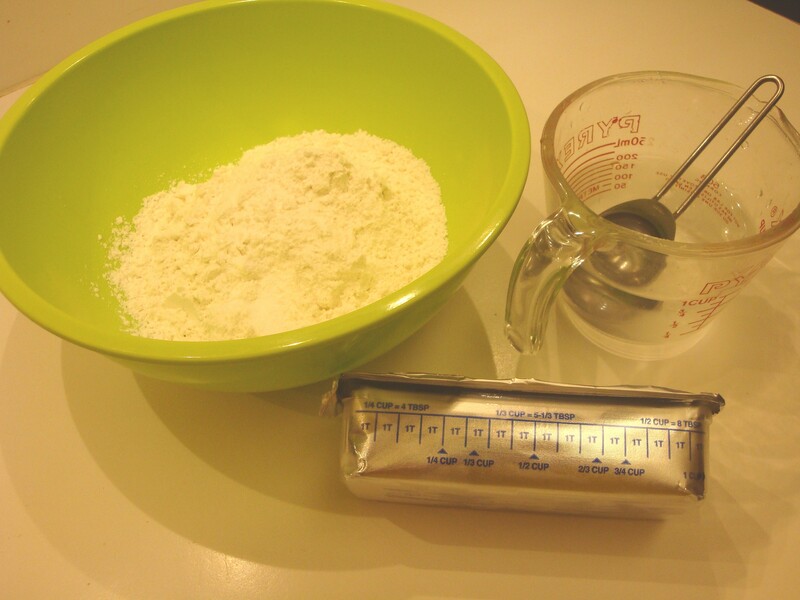 In a medium bowl, combine the flour and salt. 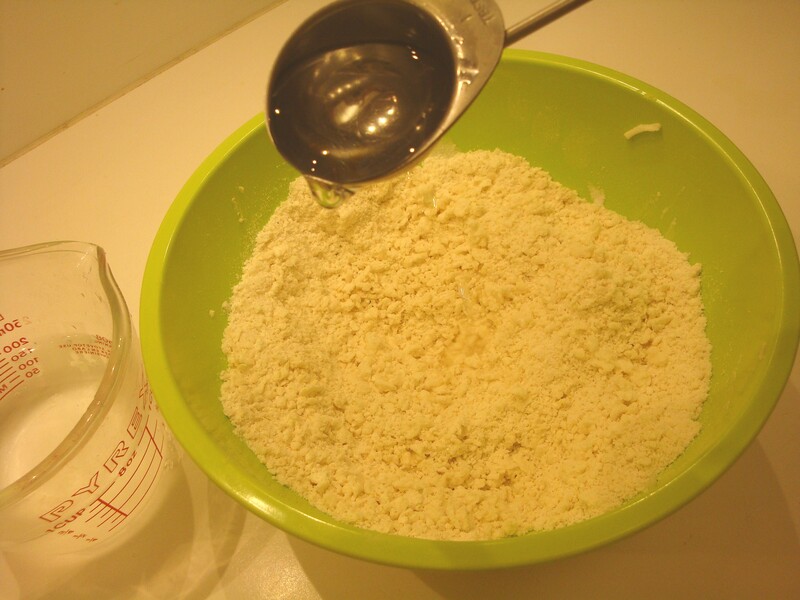 Using a pastry blender, cut the lard into the flour until the mixture resembles coarse meal. 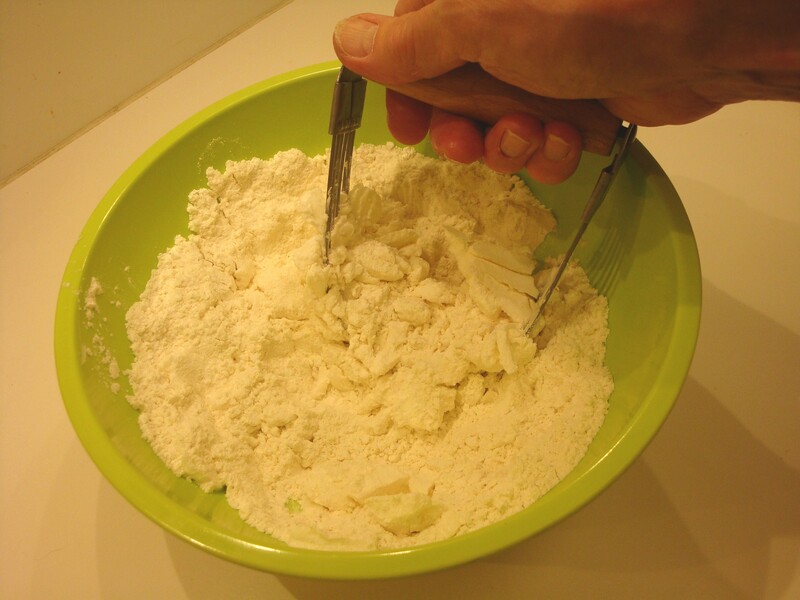 Tossing with a fork, sprinkle on the water, mixing until the dough holds together when pinched between your thumb and forefinger. (you may have to add additional ice water). 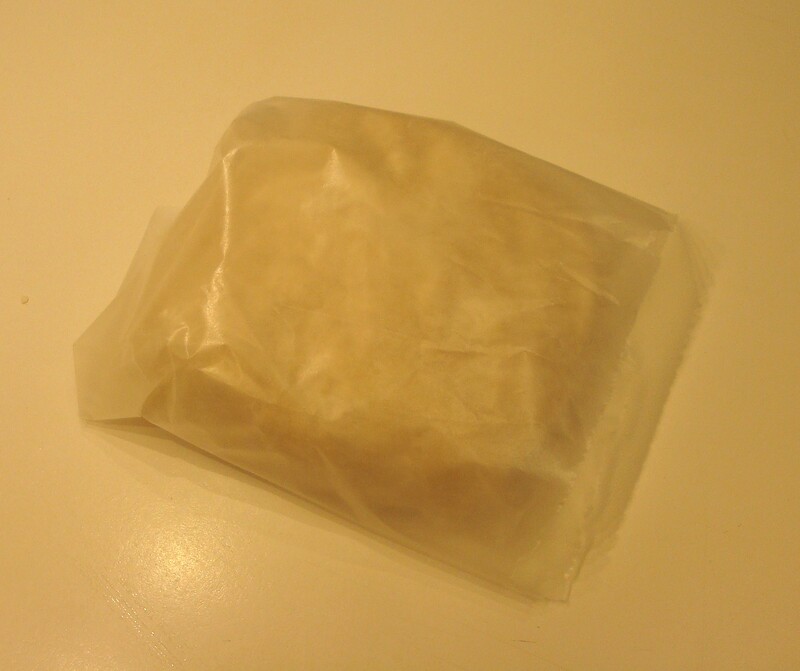 Gather the dough into a thick rectangle, wrap in wax paper and refrigerate for an hour. Following the chilling of the dough, I began rolling it out. At this point, I determined that the apple mixture was going to overflow my regular 10 inch pie plate, so I decided to go with a deep dish 10 inch pan (probably should have followed the pie crust recipe with the apple pie recipe!). 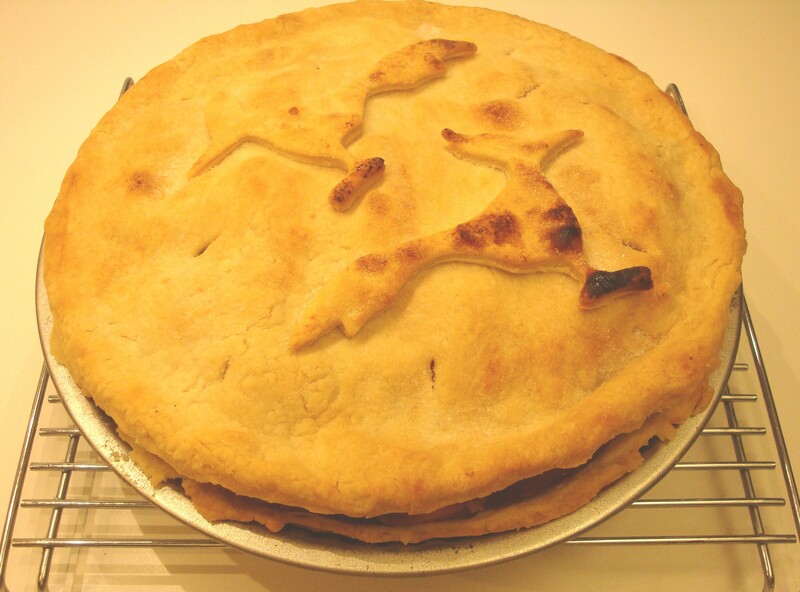 During the baking, none of the contents oozed out of the slits in the top crust, and after removing it from the oven, the top crust actually separated from the rest and sat high atop the filling! 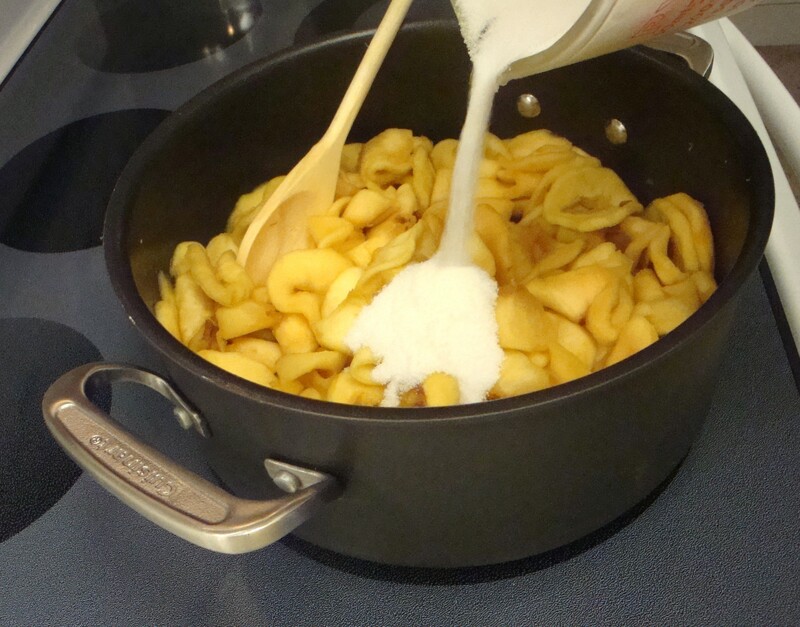 But, after cooling and settling, gravity did it’s thing and it settled back down to normal. After cooling, gravity did it’s thing and the crust settled! 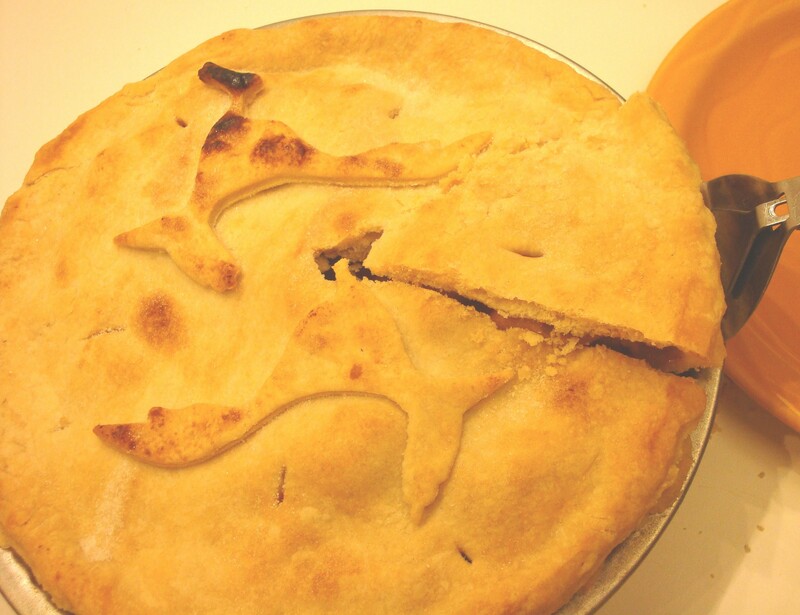 The pie turned out to be very tasty, however, it was lacking somewhat in the liquid portion of the contents. 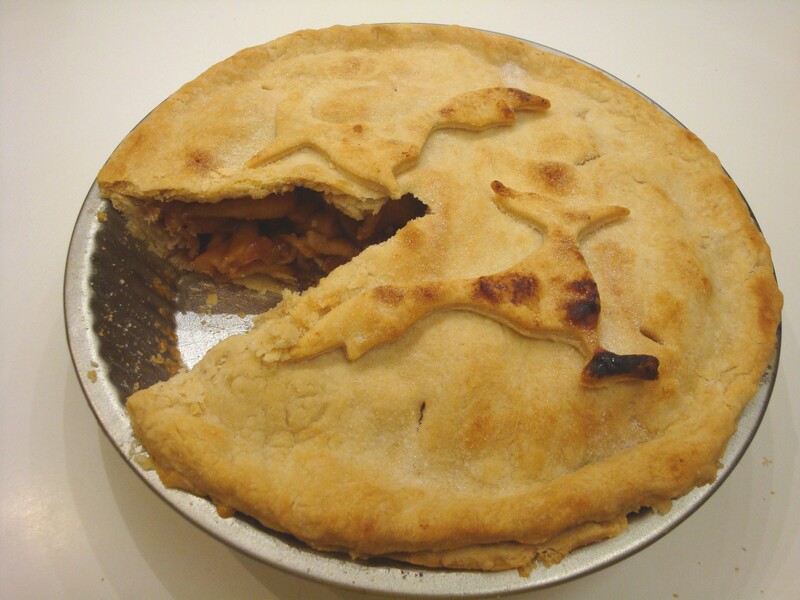 Although not dry by any means, it was not runny at all and I think that the next time, I might add additional apple juice to increase the liquid portion of the pie. 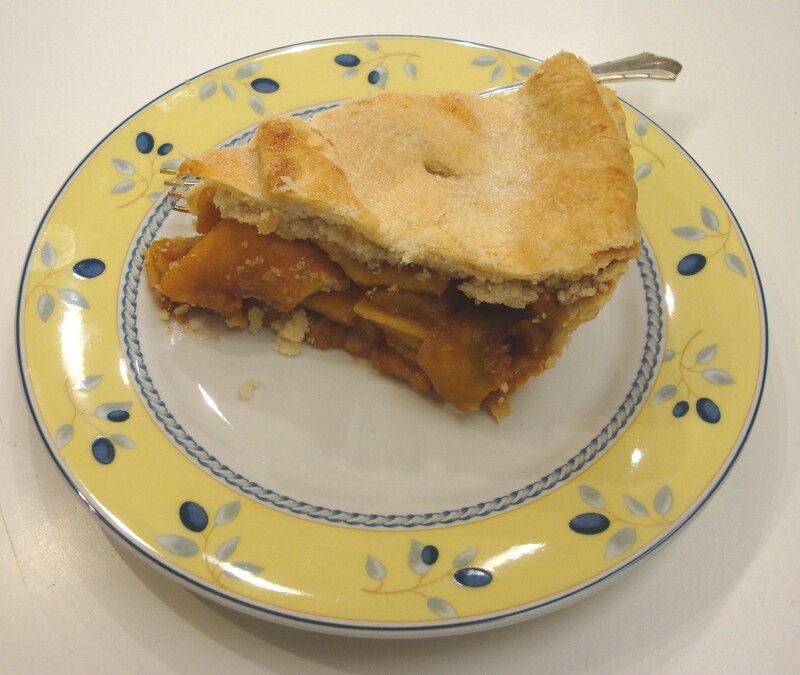 A tasty, but very dense and solid apple pie! 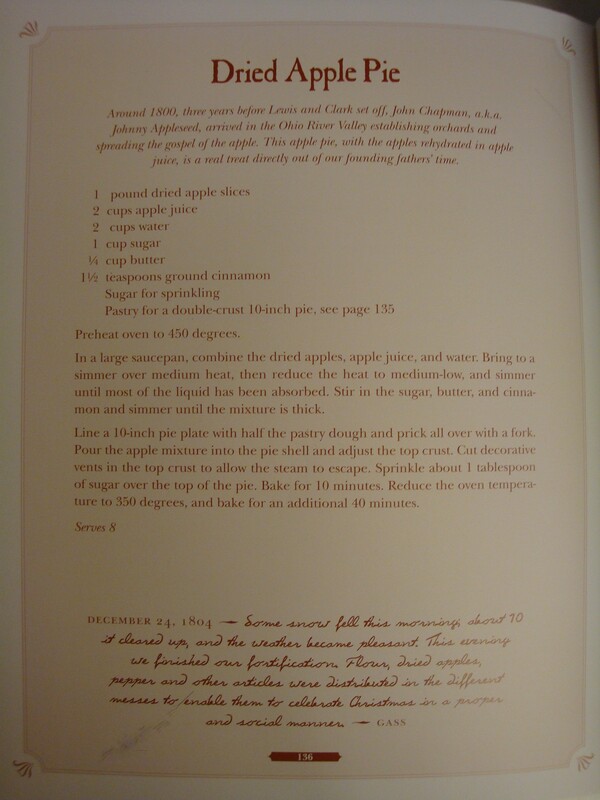 This entry was posted in Comfort Food, Cookbooks, Cooking, Cooking and Social History, Cooking Technology, Eating, Recipes, Uncategorized, Vintage Cookbooks and tagged B.Byron Price, cookbooks, Cooking, Dehydrated Apple Pie, Exploration of the West, food history, Leslie Mansfield, Lewis & Clark, Lewis & Clark Expedition, President Jefferson, social history, Southwest, Sue Jimenez, The Chuckwagon Cookbook, The Lewis & Clark Cookbook, time capsules. Bookmark the permalink.